The new Biketown station at SW 3rd and Oak. Anyone who acts to protect themselves from a clause buried in the Biketown contract that prompts users to waive their jury-trial rights is protecting themselves permanently, the bike share operator says. At issue is a “binding arbitration” clause in section 15 of the long rental agreement to which people must agree in order to use the public system. Such clauses, which are designed to prevent class actions and other customer lawsuits, are increasingly common for credit card companies and other corporations but are rare among public bike share systems. But as we reported Thursday, the contract includes a way for Biketown users to protect themselves: you have to send an email with a particular subject line to a particular email address mentioned in the contract. 1) Permanent protection: If someone uses Biketown — whether for a single trip, a single day, or as part of an annual membership — and then sends the necessary email within 30 days, they’ll be protecting their jury rights for anything that might go wrong on all future rides. “If an individual opts out once we will honor that individual’s opt-out for future pass purchases,” Motivate Director of Communications & External Affairs Dani Simons wrote. 2) Multiple chances to act: If someone fails to send the required email within 30 days of their first use and then uses the system again, they get another 30-day chance to send the email and permanently protect their rights. “If someone lapses and then rejoins they will have an additional 30 days to decide if they want to opt-out,” Simons wrote. It’s worth noting that though these promises come from a Motivate executive, they’re not actually written into the contract that Biketown continues to force users to agree to. Motivate might someday argue that Simons’ commitments in the media now aren’t legally binding. You have the right to opt out and not be bound by the arbitration and class action waiver provisions set forth above by sending written notice of Your decision to opt out to legal@motivateco.com with the subject line, “ARBITRATION AND CLASS ACTION WAIVER OPT-OUT.” The notice must be sent within thirty (30) days of Your first use of the Services, otherwise you shall be bound to arbitrate disputes in accordance with the terms of those paragraphs. Mark Ginsberg, a Portland plaintiff’s attorney who specializes in biking issues, noticed the clause on Wednesday. After our coverage Thursday morning, Oregonlive and Willamette Week have followed up. Ginsberg said Friday that KATU-TV is running a piece of its own Friday evening. On Thursday we did a scan of various public bike-sharing user agreements around the United States and found that the systems in New York City, Chicago, Washington D.C., Boston, Philadelphia, the San Francisco Bay and Los Angeles all lack binding arbitration clauses. The only ones we could find that do have them are in Portland, Seattle and Phoenix. The post Biketown says users will get multiple chances to protect their jury-trial rights appeared first on BikePortland.org. 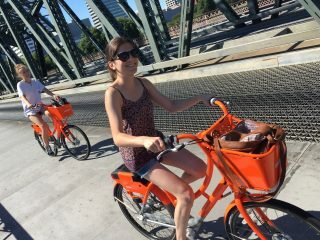 Biketown users on the Hawthorne Bridge yesterday. Buried in the “miscellaneous” section of the user agreement for Portland’s new bike-sharing system is a notice that Biketown users are waiving their rights to a jury trial. Unless, that is, they sent a one-line email to the company that operates Biketown within 30 days of first using the system. If they don’t, a prominent Portland bike lawyer says, their chances of winning any future legal claim against Biketown are slim. hey Portland friends who got BikeTown memberships, you read the contract right? In Section 15, they force you into arbitration, unless you take action within the first 30 days (clarification- within 30 days of first use) to opt out of arbitration. As your lawyer friend, I’m here to tell you that you should opt out. 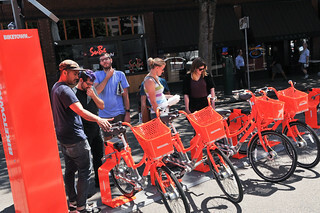 Though Ginsberg referred to people who buy memberships, the terms apply to all users of Biketown, including people who buy rides $2.50 at a time. What’s “arbitration” in this context? As reported in depth last year by the New York Times, it’s an increasingly common system that was designed to reduce the chance that companies will lose lawsuits brought by their customers. By including requirements like these in their terms of service or user agreements, the Times reported, consumer complaints are heard by a corporate lawyer rather than a government judge. “The arbitrators are paid for by the bad guys,” summarized Ginsberg, the plaintiff’s attorney. Like many similar contracts, Biketown’s binding arbitration clause also prevents bike-share users by default from joining class action lawsuits, which are a primary tool consumer attorneys use to penalize companies for wrongdoing. Because class actions can be costly to businesses and are more lucrative for plaintiff’s attorneys than for most plaintiffs, they are controversial. But they also undeniably create an incentive for companies to beware of defrauding or mistreating customers. Fortunately for Biketown users who happen to know the secret, the Biketown contract makes it easy a member to retain those legal rights. Capital Bikeshare in Washington DC is one of many that doesn’t require users to waive their jury trial rights if something goes wrong. 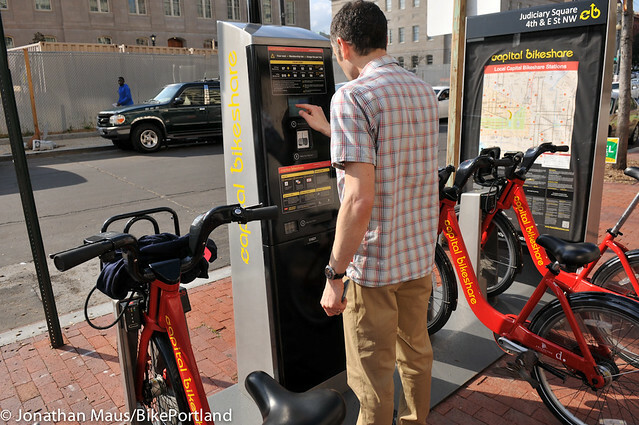 A review of several other user agreements at U.S. bike sharing systems shows that some include a binding arbitration provision and others don’t. One that does is Pronto in Seattle, which like Biketown is operated by Motivate, the New York City-based firm that was launched in Portland before its owners sold it amid financial trouble in 2014. Another that does is Grid Bikes in Phoenix, operated by Cyclehop. Unlike Biketown, Pronto and Grid Bikes don’t seem to offer the “opt out” that lets users retain their jury rights. New York City’s Citi Bike, Motivate’s flagship system, includes no arbitration clause. Neither do Motivate’s other largest U.S. systems, Capital Bikeshare in Washington DC, Divvy in Chicago, Hubway in Boston or Bay Area Bike Share in San Francisco. Neither does Metro Bike Share in Los Angeles, which launched this month, or Indego, the year-old system in Philadelphia. Those two are operated by Bicycle Transit Systems, a competing firm that was founded by ex-Alta Bike Share employees. Denver B-Cycle, which is operated by a local nonprofit, also has no binding aribtration clause. 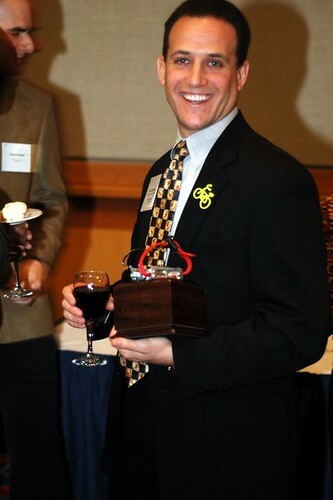 Lawyer Mark Ginsberg at the Bicycle Transportation Alliance Alice Awards in 2007. Ginsberg looked over the Seattle, Los Angeles and New York City contracts and said that “all these contracts are not very consumer friendly.” He singled out the binding arbitration in Portland, Seattle and Phoenix as “not fair,” but also said it’s not unusual for corporate user agreements. Ginsberg also called attention to what he called the “loser pays” attorney fee provisions, which he said created a disincentive for individuals to bring lawsuits, and to the indemnification clause, which force the user to assume full legal responsibility for anything they do with the bike sharing company’s equipment. City transportation spokesman John Brady said in an email Thursday that the city wouldn’t comment on whether it ever discussed these issues with Motivate. Throughout the process of launching BIKETOWN, we have been careful not to discuss the ins and outs of the contract negotiations. We feel this is important in order to preserve the integrity of both past and future negotiations. I asked Ginsberg if, knowing what he does now, he would use Biketown. Ginsberg added one other thing: Biketown’s 30-day opt-out clause for binding arbitration is the same one used by Pokémon Go. 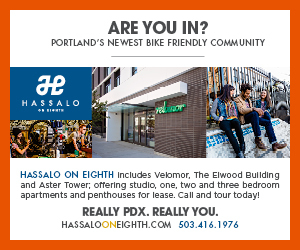 The post Biketown contract forces users to waive their legal rights – unless they act quickly appeared first on BikePortland.org. Small business owner Rowan Kimsey was seriously injured in a traffic crash over five months ago. She still doesn’t have a copy of the police report. For many traffic crash victims the difference between getting a check from the insurance company and getting nothing comes down to one document: a police report. And for an increasing number of Portlanders the time it takes to receive a copy of that report has ballooned from two weeks to up to six months. These victims are in limbo. Without a police report they can’t get paid what they’re owed and they can’t fully heal emotionally because they often aren’t even able to find out basic information — like the first and last name — of the person who hit them. 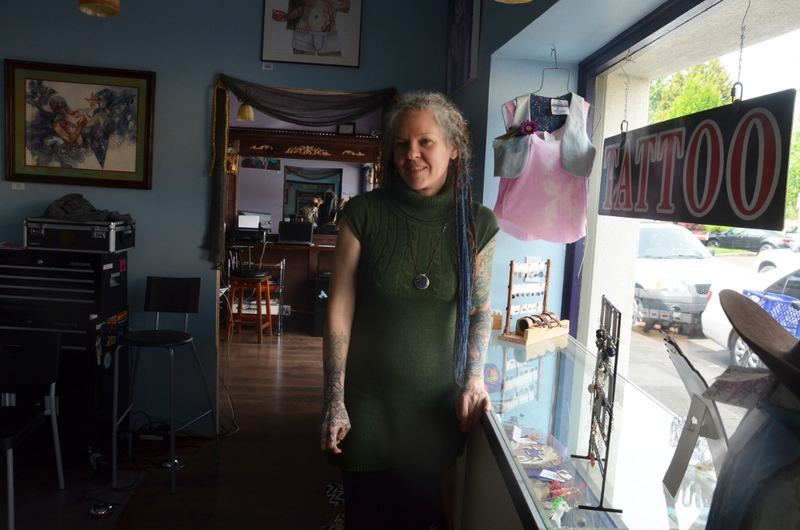 50-year-old Rowan Kimsey, an artist who just opened up The Lucky Mermaid tattoo studio in the Montavilla neighborhood, is living this nightmare. She was hit in 2015 and still doesn’t have a copy of her police report. On November 3rd of last year Kimsey was biking home from work on SE Division Street (just two days after closing the sale on her new studio) when a woman driving a truck passed her so closely that the side-view mirror slammed into Kimsey’s back. The impact broke three of her ribs, collapsed and punctured one of her lungs, ruptured her spleen and damaged her diaphragm. She spent four days in the hospital and it took over two months to fully recover. Kimsey’s attorney, Mark Ginsberg of Berkshire Ginsberg LLC, requested the police report on February 5th. It’s been 76 days and the Records Division still hasn’t filled the request. Most insurers require a police report to act as the “proof of loss” document needed to process a claim. Ginsberg, a former Chair of the City of Portland’s Bicycle Advisory Committee, has been trying to bring this issue to the attention of the police bureau and Transportation Commissioner Steve Novick’s office for two months but says he’s been ignored. Ginsberg finally got a reply to his emails on Tuesday — the same day he said he was taking his story to the media. Now he’s in touch with the captain of the PPB Traffic Division and staff from City Hall and the records division. Meetings are planned and possible solutions are finally being discussed; but according to PPB Records Division Supervisor Tammi Weiss the fix won’t be easy. And it won’t happen overnight. Weiss says she too is frustrated by the backlog, which is the largest it’s been in the 26 years she’s worked in the division. Weiss said up until 2014 the average time to fulfill a request was about 21 days. Along with the lack of staff (a problem exacerbated by obligations the division has to U.S. Department of Justice requests), a new records software program just went live at the end of last year and all existing staff had to be trained to use the system. Is there a way to pull out more urgent requests and do them first? Weiss said they prioritize records that have been subpoenaed by a court, but other than that it’s “tricky” because they work on a first-come, first-served bases and it becomes a “balancing act” to make sure no one has an unfair advantage. Weiss said she’s been aware of Ginsberg’s concerns and is working on a solution to the problem, like trying to find shortcuts to process requests faster without disclosing sensitive information. Another interim fix is getting more police officers to issue information exchange forms at the scene of a crash. Those non-legal forms are very common in fender-benders when an officer decides a full report isn’t necessary. Unfortunately, Ginsberg says these information exchange forms are often not made available when one of the parties of the collision is a bike rider or walker — because they are often incapacitated due to injuries or in an ambulance and not able to advocate for themselves at the scene. In one of the stacks on Weiss’s desk is the request from Rowan Kimsey. 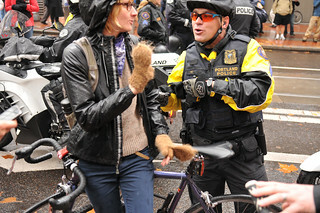 The post Crash victims in limbo as police records backlog swells to six months appeared first on BikePortland.org. your rights can make them smoother. 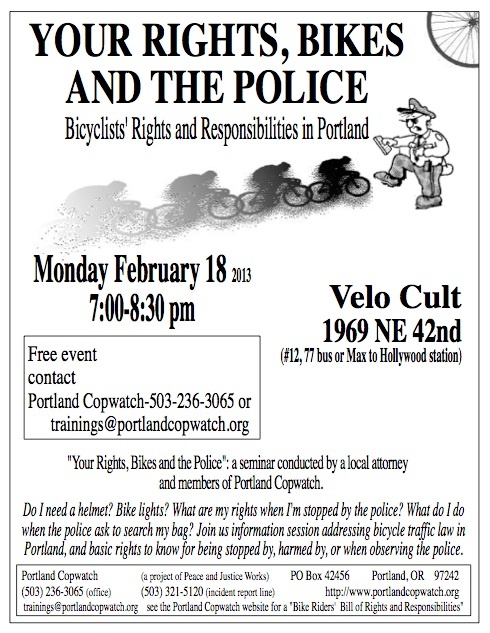 The issue of how to relate to police officers while riding your bike is one that demands knowledge and understanding. While a solid grasp of the law might not be enough to avoid a messy situation (as emotions on both sides during an event or a traffic stop can quickly trump rational thought), a greater understanding of the law is always needed. Mark Ginsberg is a Portland lawyer who specializes in bike-related cases. He goes way back in Portland’s bike scene and has extensive experience in representing people in bike injury and law cases. Ginsberg has also participated in many bike events over the years from races to bike parades, and Critical Mass. He also has a long history of working with the Police Bureau. Ginsberg organized a summit between the Portland Police and Zoobombers in 2007 after a clash about riding on Highway 26, he represented Ayla Holland in the infamous fixed-gear brake case, and he represented Ben Ramsdell in the Clinton Street road rage case of 2009.